The nineteen outstanding contributors to this deeply insightful book concur in envisioning a fundamentally new systematic concept of contract law that, while preserving the essential ‘architecture’ of the existing European codes, would nonetheless find cogent ways to integrate such modern developments as mass transactions, chains and networks of contracts, regulation of markets and contracts to protect consumers, and service and long-term contracts into an optional European code. The authors perspectives cover a wide range of jurisdictions, including new EU Member States. 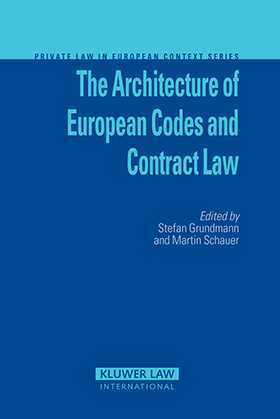 The book’s commitment to an integration of comparative law, EC law, and the debate on European codification offers practitioners and academics fertile ground for the development of a new model of contract law that is more than a common denominator of what has been in force so far. This model may serve as a basis for Europe-wide and perhaps even worldwide discussion.